My friend Lindsay from Makely School for Girls invited me to be a part of her Knocktoberfest line up this week. All week long, Knocktoberfest bloggers will be showing you their knock-off creations and sharing tutorials on how to create your own. Sounds like fun, right? Time to don your lederhosen and fill up a frothy mug because this party starts now! Okay, now before you throw a pumpkin or turkey at me, I know we haven’t even gotten through Halloween yet. 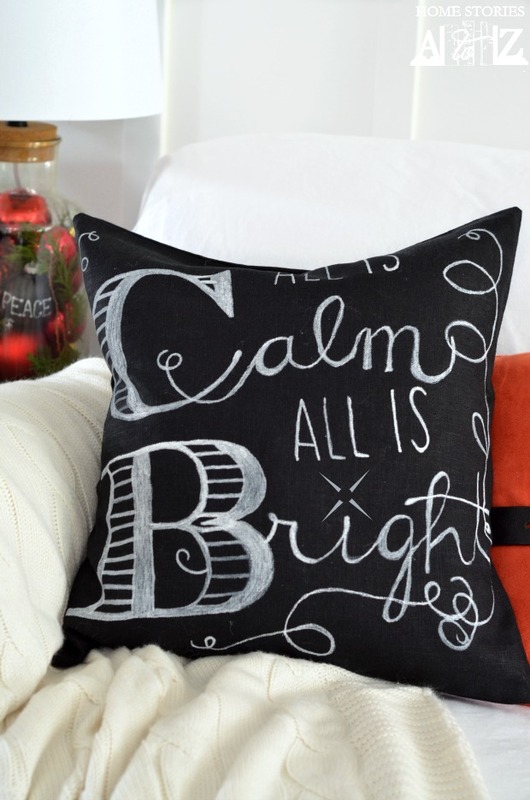 I promise to enjoy each holiday, but I absolutely LOVE Christmas and just couldn’t resist making a knock off version of the Pottery Barn All is Calm pillow cover. At $29.50, this pillow cover is quite affordable (but as I type this the website shows that it is on backorder until November 15th). I really wanted this cover NOW. So what’s a girl to do? Make one of course. 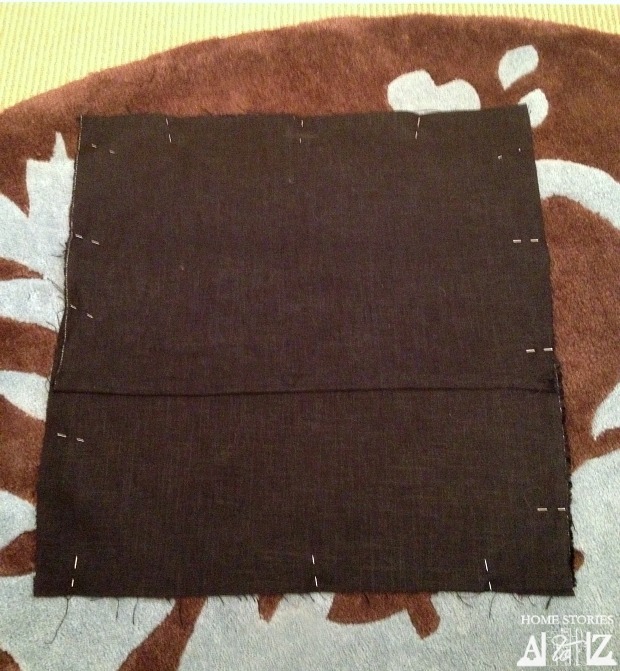 Step 1: Cut and sew your pillow cover. I debated whether or not to share a step-by-step tutorial with you on how to make an easy pillow cover. I learned from the video below so it seemed much more fair to just link to the video! She does an excellent job at breaking down all of the steps for you. Pin for later! 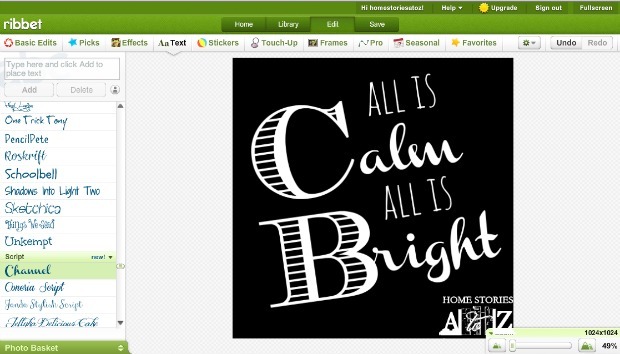 Step 2: Create your chalkboard art in a photo software. Some of the drawing on the pillow will need to be done freehand. I am a horrible artist, so I wanted as much help as possible to get started! I created a similar-looking chalkboard word art using Ribbet.com. I like Ribbet because it allows you to load your own fonts into their program. Step 3: Project image and begin tracing with fabric marker. 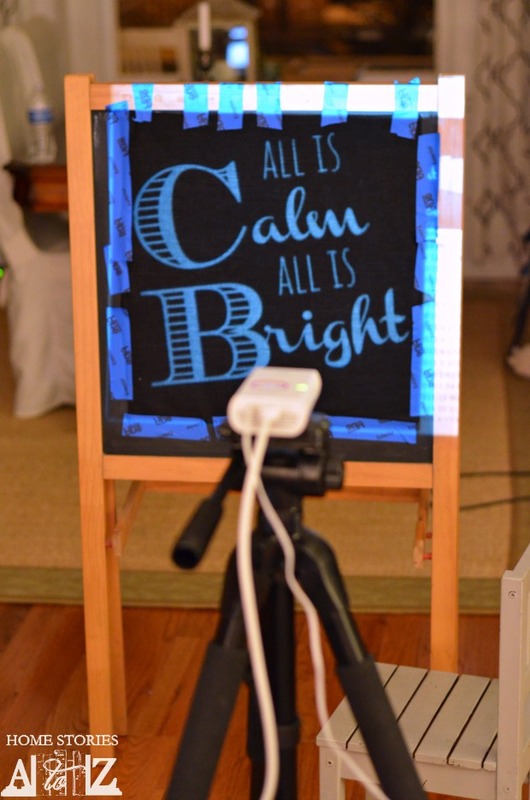 I taped my pillow cover to an easel and set my projector on a tripod. 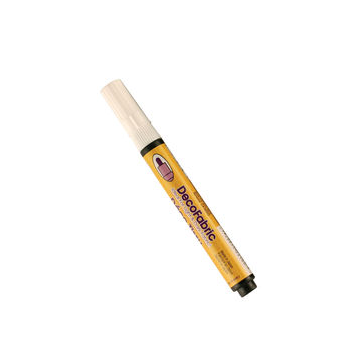 Use your white fabric marker to trace the lettering. You will need to refer to the original image to create the embellishments and correct lettering. And that is all there is to it! Enjoy your knock off! I am thrilled with how it turned out. And of course I couldn’t just show you the pillow without creating a little Christmas context for all that cuteness to dwell in. Do you see my belted Santa pillow? That “red” pillow is actually a blue and red paisley pillow. I just turned the pillow around to show the back. I grabbed one of my old belts to create the Santa look. 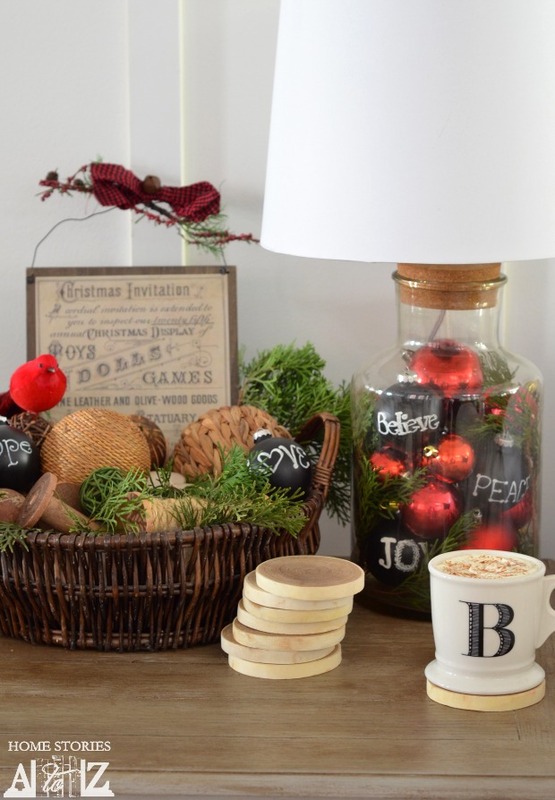 The chalkboard ornaments were made back in 2010, and I was excited to pull them out and reuse them. You can see the tutorial on how I created them here. And one more close-up before I sign off! This pillow was really fun and pretty simple to make. I plan to make another one in red for the other side of the couch. Thanks for stopping by and be sure to hop on over to Gina’s from The Shabby Creek Cottage to see her Knocktoberfest creation. I hope you’ll visit everyone in the Knocktoberfest line-up. I know what many of these ladies are creating this week, and it is some gooooood stuff! You won’t want to miss it. Omg! I love this! I’ve been eyeballing pillows like this everywhere but their priced so crazy! Not just the holiday ones but the everyday pillows with like a sea theme are $70! And like you. I’m not about to pay my hard earned money on a pillow! (It better be filled with gold….or chocolate, I will take chocolate too!). I’m soooooo going to make this! Thank you for the inspiration and how to! Yay! So glad you liked the post. 🙂 Let me know how your pillows turn out. Hi. Omg I am super excited to have found ur blog through pinterest. Cant wait until my kids are asleep to go back through your posts. Totally love ur pillow, was just looking at it in the pb catelog. Thanks so muxh for sharing ur talent and idea!!! 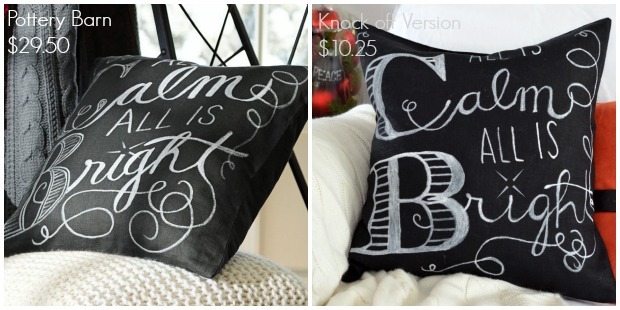 The chalk pillow knock-off is great! However, I LOVE, LOVE, LOVE the “Santa” pillow. Such a creative use of something you already had. I love the Christmas decor in the lamp! So subtle but very cute! Is the lamp a purchase or another DIY? Thanks Erin! I didn’t make this one. 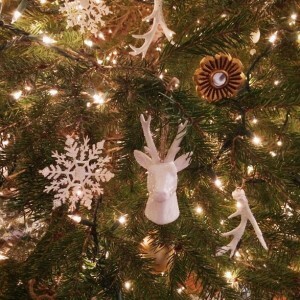 I bought it from a store called The Christmas Tree Shop. I like yours way better than the original. And that Santa Claus pillow is genius in its simplicity too. You out did yourself, Beth! I love the pillow. i love this! i am gonna try to make something similar soon. 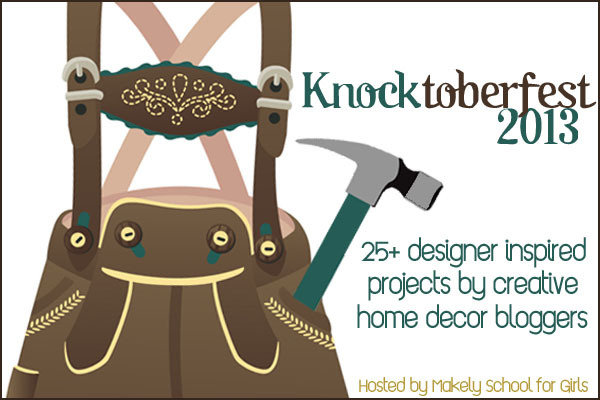 I love this “Knocktoberfest” idea & your project turned out great! The way you have it staged also looks amazing. You’re just all that in a bag of chips! Thanks Patti :). I seriously could not live without my projector at this point. I use it ALL the time for decorating. Wow this is gorgeous! You did an incredible job on this! LOVE it! I love your pillow!! I think I am going to try to make one myself!! 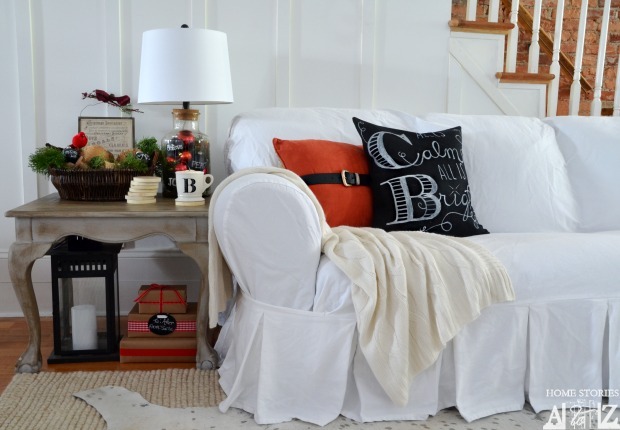 There’s so much I love about this project… I will definitely be trying my hand at some festive pillows the season, I just bought a sewing machine this past weekend! Okay, you styled this so perfectly that, at first, I thought your room was the Pottery Barn Catalog! It wasn’t until I scrolled back up to the top to READ the post that I realized it was yours! LOVE IT! lamps back in the day when we were first married and I wish I still had them. They were wonderful. Please share! AND I’m totally going to make some of the ornaments to send to my sister in NH who just got her first permanent teaching job. They will make a wonderful gift for her. Thanks so much for the great ideas. Thank you Kim :). 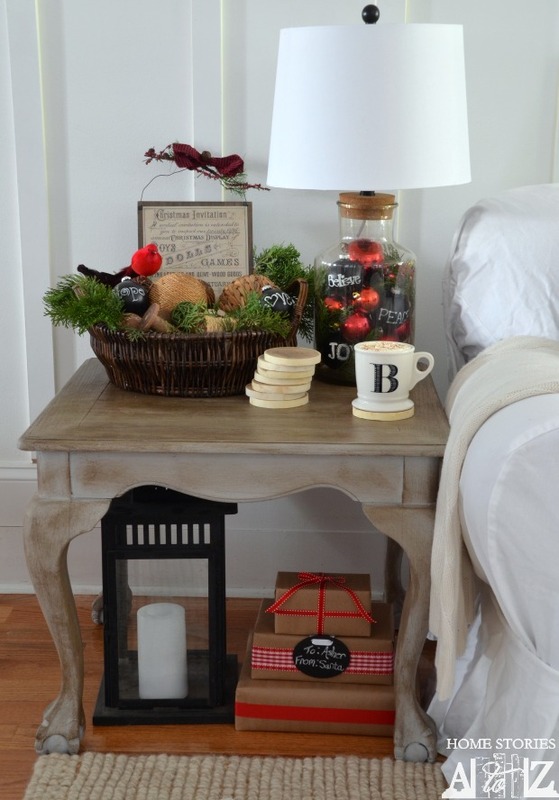 The lamp was purchased at a store called the Christmas Tree Shop. They aren’t nationwide but might be in your area depending on where you live in the country. 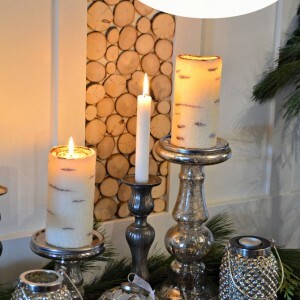 It’s a great shop for inexpensive home decor. Congrats to your sis on her teaching job! I’m sure she’ll love her gift :). Hi Christina! Thanks for visiting me and for the pin :D! So gorgeous, Beth! 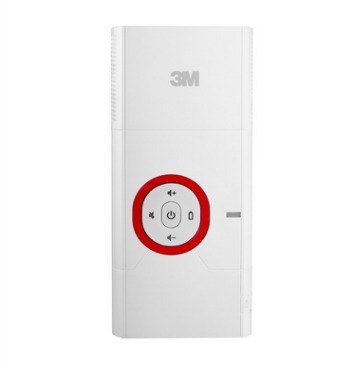 I love a good knock-off and this one is outstanding! 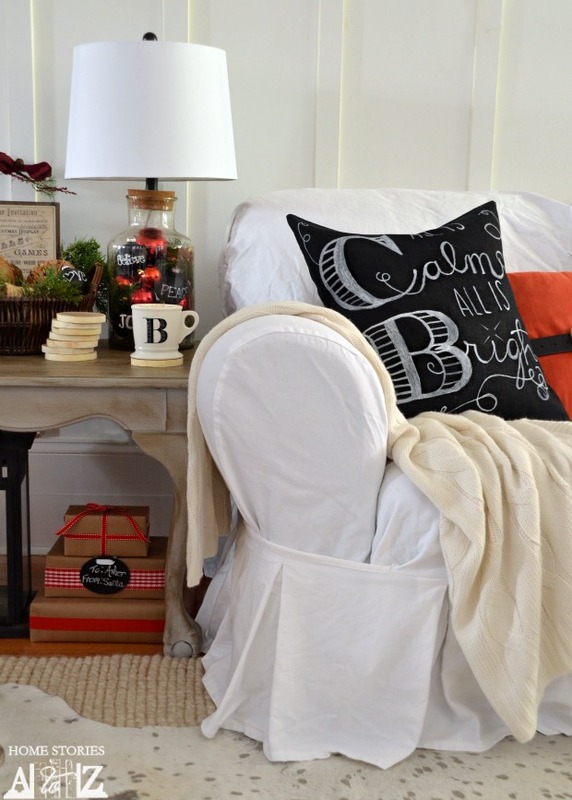 Also love how you belted the red pillow as an homage to Santa–how cute! Thanks so much for sharing– have a wonderful week! That’s absolutely gorgeous! Love a good PB knock off – and yours is spot on! Beth, Love it! I can totally relate to wanting it now…the biggest thing that makes me turn away from a purchase is the word backorder. I am pinning to my chalkboard art board! I know right? Backordered purchases are too much delayed gratification for me :). Thanks for the pin! So cute Beth. A beautiful chalkboard effect without the usual temporary nature! Hi Kristine! Thanks for stopping by :). I used Channel for the script font but honestly just freehanded the lettering and used the font as a letter spacing guideline. I couldn’t find a font that was any closer to the Pottery Barn one. Thanks so much for taking the time to respond Beth. Beth! I love this so, so much! Beautiful job! Thank you Lindsay! Cheers to Knocktoberfest! Such a cute project Beth! I never like to spend much on seasonal decor so I think your knock off is super smart and how cute is the belt around the red pillow – thanks for the idea!